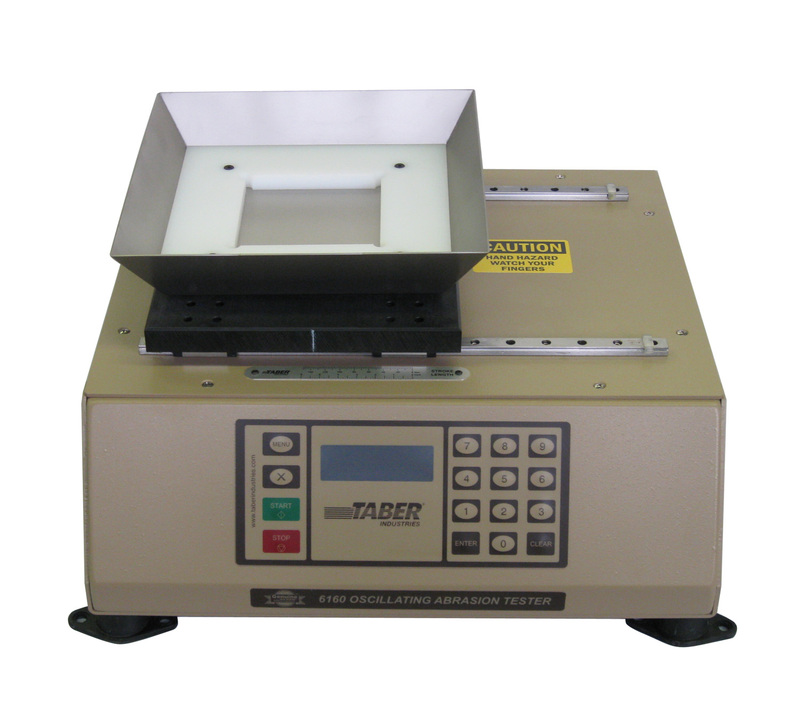 The TABER® Oscillating Abrasion Tester - Model 6160 is best known as an "oscillating sand tester". Described in ASTM F735 (Standard Test Method for Abrasion Resistance of Transparent Plastics and Coatings Using the Oscillating Sand Method), the oscillating sand tester is used to measure the relative abrasion resistance of a material to surface abrasion and / or marring. The primary application of the Oscillating Sand Abrasion Tester is for transparent materials and coatings utilized in windows and lenses, but it might also be used to evaluate organic paints & coatings, plastics, metals and other materials. Rigid specimens that are 100mm square and less than 12.5mm in thickness are mounted in a holder located in the bottom of a sand tray so the surface is flush within 1mm. The tray is filled to a uniform depth (e.g 12.5mm) with a standardized abrasive media such as quartz silica or alumina. A scotch-yoke drive system reciprocates the tray in a back-and-forth (to-and-fro) motion which causes the entire mass of the abrasive media to shift significantly within the tray. The oscillating movement of the abrasive media results in a random pattern of scratches which simulates normal everyday wear. Test parameters can be altered with Taber's Oscillating Sand Abrasion Tester, and allow the operator to select the operating stroke length (6.5 to 150 mm) and speed (variable from 100 - 200 cycles per minute). ASTM F735 specifies the sand tray travels a distance of 100mm at a speed of 300 strokes per minute (150 cycles per minute). Using a custom specimen holder (not supplied), materials of various shapes may also be tested. To generate useful data, it is important to recognize that the amount and force of abrasive media that contacts the specimen surface will change based on the curvature of the part. Specimens with a severe contour may inhibit the movement of the abrasive media during the test. An optional kit is available to conduct the Bayer Abrasion Test on contoured lenses. This set-up involves testing a specimen against a control lens for comparative purposes. In December 2011, Taber Industries learned that the sole source provider of the 4/10 abradant described in section 6.1 of ASTM F735 was sold and the new company discontinued the product. In June 2017, ASTM's Committee F07 on Aerospace and Aircraft approved the recommendation to update the abrading medium referenced in ASTM F735 to a quartz silica sand, graded 6/9 which had been supplied as an alternative since December 2011. Besides the silica abrasive media, other potential abradants include alumina (zirconia), silicon carbide, aluminum oxide and glass bead. For repeatable test results, the sizing and shape of the abradant is absolutely critical. During testing, the abradant may become 'worn' as the sharp edges contact the specimen and other abrasive particles. To ensure reproducibility, new abrasive media should be used for each test. It is also recommended that the abrasive be replaced after 300 cycles for longer cycle tests. Using a haze meter, the haze and light transmission of a transparent test specimen is measured and recorded. After subjecting the specimen to the specified number of abrasion cycles, the results are measured as a change in haze and light transmission. Abrasion resistance for opaque materials is measured visually or by weight loss. 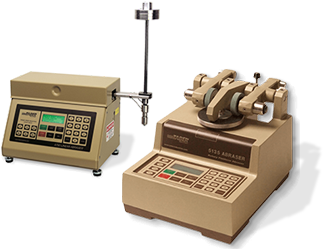 The following link provides a listing of test methods the Taber Oscillating Sand Abrasion Tester satisfies. Please note, additional accessories may be required.